Less known than other destinations on the Costa del Sol, such as Marbella, Estepona or San Pedro de Alcántara, Benahavis escales positions everyday as the preferred place to acquire real estate. It is not surprising, since the municipality of Benahavis has a vast territory (145 km2) of enormous landscape and urban diversity, with many areas of privileged location and, therefore, with excellent options for almost all tastes. It is, so to speak, the model that best sums up the lifestyle of the Costa del Sol. If something can be said to be “missing” it is the beach, but this is not a real inconvenience, since a 15- 20 minutes drive allows sea lovers to enjoy in their favorite areas. The beauty of Benahavis lies precisely on its being an interior area in an elevated terrain, which guarantees spectacular views from a lot of points. This is the reason why it has become a preferred area for the construction of villas and golf courses, although there is much more, as we will see. Did you know that Benahavis is home to one of the most picturesque traditional Andalusian towns on the Costa del Sol and also the most exclusive luxury villas development in Europe? Benahavis village is certainly a charming place, with its white houses and steep streets, nestled between mountains of great scenic beauty, so it is not surprising that it has become a mecca for painters and artists of all kinds, as well as chefs and restoration entrepreneurs. Benahavis village proves that the Costa del Sol is not only synonymous with beach and party, but also offers much more traditional ways of life, in a quiet place away from tourism, in the midst of extensive natural areas that constitute an authentic paradise for hikers. A bit further inland we find La Zagaleta, an estate formerly owned by famous Adnan Kashoggi, which has become an urbanization of luxury villas, the most sought after by millionaires throughout Europe. One of the keys to the success of La Zagaleta is its privileged location, on a mountainous terrain that dominates the landscape and allows total tranquility and privacy, as well as impressive views of the Mediterranean, the Rock of Gibraltar and the African coast. The latter is not, however, a privilege only for millionaires. The extensive area of ​​the municipality of Benahavis that opens onto the sea ascends progressively as we enter the land, allowing real estate developments to be situated at different heights and offer the best views we can find on the Costa del Sol. This includes the gardens and lower floors of the villas, as well ground floor apartments. Yet another great attraction in Benahavis is golf. Benahavis is a worthy rival to the so-called Golf Valley, in the area of ​​Nueva Andalucia (inner area of ​​Puerto Banus), which is famous for its golf courses. In fact, the municipality of Benahavis borders this area at its southeast end and La Quinta Golf & Country Club (one of the most exclusive golf resorts in Benahavis) is officially part of the Golf Valley. 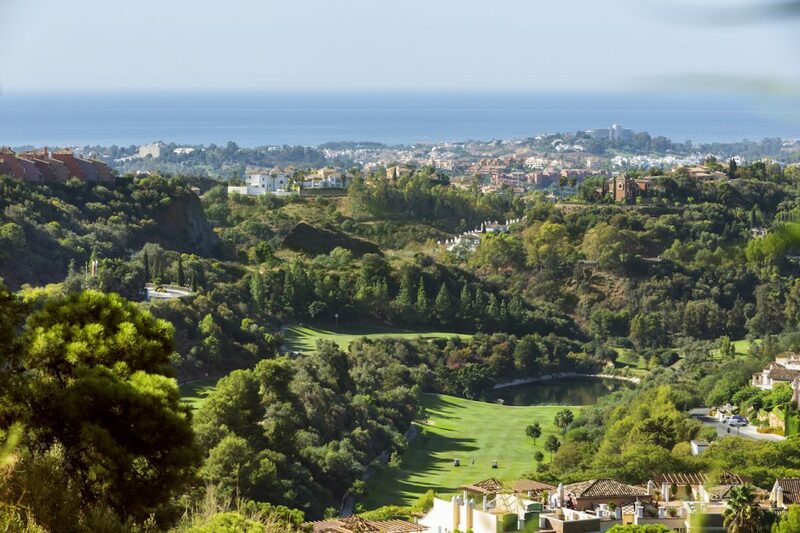 Here we have a good example of what we were saying before about the views: La Quinta, due to its elevated position, is the only one of the fields of the Golf Valley that offers spectacular views of the sea. In addition to this, Benahavis is home to the emblematic fields of Los Flamingos, Los Arqueros, El Higueral, Marbella Club Golf Resort, La Zagaleta, Los Barrancos de la Zagaleta and Benahavis Golf Club. El Madroñal, Las Colinas de Marbella, Monte Halcones, La Heredia or Reserva de Alcuzcuz are other luxury residential areas that make Benahavis one of the most valued areas on the Costa del Sol and throughout the Mediterranean.